(Nanowerk News) DNA has garnered attention for its potential as a programmable material platform that could spawn entire new and revolutionary nanodevices in computer science, microscopy, biology, and more. Researchers have been working to master the ability to coax DNA molecules to self assemble into the precise shapes and sizes needed in order to fully realize these nanotechnology dreams. For the last 20 years, scientists have tried to design large DNA crystals with precisely prescribed depth and complex features — a design quest just fulfilled by a team at Harvard's Wyss Institute for Biologically Inspired Engineering. The team built 32 DNA crystals with precisely–defined depth and an assortment of sophisticated three–dimensional (3D) features, an advance reported in Nature Chemistry ("DNA brick crystals with prescribed depths"). The team used their "DNA–brick self–assembly" method, which was first unveiled in a 2012 Science publication when they created more than 100 3D complex nanostructures about the size of viruses. The newly–achieved periodic crystal structures are more than 1000 times larger than those discrete DNA brick structures, sizing up closer to a speck of dust, which is actually quite large in the world of DNA nanotechnology. "We are very pleased that our DNA brick approach has solved this challenge," said senior author and Wyss Institute Core Faculty member Peng Yin, Ph.D., who is also an Associate Professor of Systems Biology at Harvard Medical School, "and we were actually surprised by how well it works." 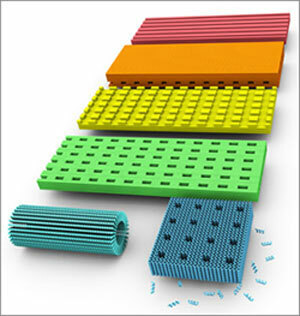 Scientists have struggled to crystallize complex 3D DNA nanostructures using more conventional self–assembly methods. The risk of error tends to increase with the complexity of the structural repeating units and the size of the DNA crystal to be assembled. The DNA brick method uses short, synthetic strands of DNA that work like interlocking Lego® bricks to build complex structures. Structures are first designed using a computer model of a molecular cube, which becomes a master canvas. Each brick is added or removed independently from the 3D master canvas to arrive at the desired shape — and then the design is put into action: the DNA strands that would match up to achieve the desired structure are mixed together and self assemble to achieve the designed crystal structures. "Therein lies the key distinguishing feature of our design strategy–its modularity," said co–lead author Yonggang Ke, Ph.D., formerly a Wyss Institute Postdoctoral Fellow and now an assistant professor at the Georgia Institute of Technology and Emory University. "The ability to simply add or remove pieces from the master canvas makes it easy to create virtually any design." The modularity also makes it relatively easy to precisely define the crystal depth. "This is the first time anyone has demonstrated the ability to rationally design crystal depth with nanometer precision, up to 80 nm in this study," Ke said. In contrast, previous two–dimensional DNA lattices are typically single–layer structures with only 2 nm depth. "DNA crystals are attractive for nanotechnology applications because they are comprised of repeating structural units that provide an ideal template for scalable design features", said co–lead author graduate student Luvena Ong. Furthermore, as part of this study the team demonstrated the ability to position gold nanoparticles into prescribed 2D architectures less than two nanometers apart from each other along the crystal structure — a critical feature for future quantum devices and a significant technical advance for their scalable production, said co–lead author Wei Sun, Ph.D., Wyss Institute Postdoctoral Fellow. "My preconceived notions of the limitations of DNA have been consistently shattered by our new advances in DNA nanotechnology," said William Shih, Ph.D., who is co–author of the study and a Wyss Institute Founding Core Faculty member, as well as Associate Professor in the Department of Biological Chemistry and Molecular Pharmacology at Harvard Medical School and the Department of Cancer Biology at the Dana-Farber Cancer Institute. "DNA nanotechnology now makes it possible for us to assemble, in a programmable way, prescribed structures rivaling the complexity of many molecular machines we see in Nature." 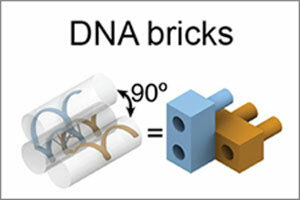 "Peng's team is using the DNA–brick self–assembly method to build the foundation for the new landscape of DNA nanotechnology at an impressive pace," said Wyss Institute Founding Director Don Ingber, M.D., Ph.D. "What have been mere visions of how the DNA molecule could be used to advance everything from the semiconductor industry to biophysics are fast becoming realities."